Dendritic cells (DC) express a set of germline-encoded transmembrane Toll-like receptors that recognize shared microbial products, such as Escherichia coli LPS, termed pathogen-associated molecular patterns. Analysis of the in vivo response to pathogen-associated molecular patterns has uncovered their ability to induce the migration and the maturation of DC, favoring thus the delivery of Ag and costimulatory signals to naive T cells in vivo. Bacterial superantigens constitute a particular class of pathogen-derived molecules known to induce a potent inflammatory response in vivo, secondary to the activation of a large repertoire of T cells. We demonstrate in this work that Staphylococcal superantigens induce migration and maturation of DC populations in vivo. However, in contrast to LPS, superantigens failed to induce DC maturation in RAG or MHC class II-deficient mice, suggesting that T cell activation was a prerequisite for DC maturation. This conclusion was further supported by the finding that T cell activation induced by 1) mitogenic anti-CD3 mAbs, 2) allo-MHC determinants, or 3) nominal Ag in a TCR-transgenic model induces DC maturation in vivo. These studies also revealed that DC that matured in response to T cell mitogens display, comparatively to LPS, a distinctive phenotype characterized by high expression of the MHC class II, CD40, and CD205 markers, but only moderate (CD86) to minimal (CD80) expression of CD28/CTLA4 ligands. This work demonstrates that activation of a sufficient number of naive T cells in vivo constitutes a novel form of immune danger, functionally linked to DC maturation. Efficient priming of naive T lymphocytes requires both the presentation of Ag in the context of MHC molecules and the delivery of accessory signals provided by adequate APCs such as dendritic cells (DC).4 The ability of DC to prime naive T cells relates to their ability to efficiently capture and present Ags and to their higher expression of MHC-encoded and costimulatory molecules able to interact with T cell-borne receptors (reviewed in Refs. 1 and 2). Numerous studies have indicated that these functional features are differentially expressed during DC differentiation. Indeed, immature DC cells, which are mostly localized at epithelial borders where they capture and process Ags, display poor costimulatory properties. Upon activation by microbial products, these cells migrate into lymphoid tissues, where they acquire the capacity to activate Ag-specific naive T cells. Indeed, DC express a set of germline-encoded transmembrane Toll-like receptors (TLRs) that recognize microbial products termed pathogen-associated molecular patterns (PAMPs) shared by large groups of pathogens. In particular, bacterial membrane components (such as LPS or peptidoglycan), proteins (such as flagellin), and bacterial DNA have been shown to interact with members of the TLR family (reviewed in Refs. 3 and 4). In addition, a recent study indicated that TLRs may establish a combinatorial repertoire to discriminate among a large number of PAMPs (5). These observations suggest that components of the innate immune system (such as DC) sample the outside world for potential pathogens and instruct the adaptive immune response as to which structures require an immune response and which do not. The present work was undertaken to better understand the early steps of the in vivo immune response to bacterial superantigens. These compounds form a large group of proteins produced by several bacterial strains (such as Staphylococcus aureus, Mycoplasma arthritidis, and Yersinia pseudotuberculosis) that have been recognized as pathogenic both in human and animals (reviewed in Refs. 6, 7, 8). Purified bacterial superantigens share with other microbial-derived compounds the ability to induce a potent inflammatory response in vivo, causing toxic shock syndrome. Numerous studies have shown that the immunostimulatory properties of these compounds are related to their ability to interact simultaneously with selected Vβ regions of the clonally distributed TCR and with a conserved domain of the MHC class II (MHC II) molecule, causing the immune stimulation of a large fraction of T cells in vivo. The presence of additional, conserved receptors, distinct from TCRs or MHC II molecules, able to interact with staphylococcal enterotoxin B (SEB) has also been described (9, 10). In particular, a recent study suggested that bacterial superantigens were able to induce an in vivo acute inflammatory response (as judged by leukocyte accumulation at extravascular sites) in immunodeficient mice lacking T lymphocytes or deficient for MHC II expression (11). Thus, in contrast to most PAMPs studied to date, it is not clear whether bacterial superantigens directly activate cells of the innate immune system, such as DC, in vivo. The purpose of this work was to analyze the maturation status of splenic DC subpopulations in vivo following administration of staphylococcal superantigens. Our observations indicate that superantigens induce DC maturation in vivo with an unique cell surface phenotype. Using a panel of genetically deficient mice, we demonstrate that their ability to induce DC maturation requires T cells and MHC II expression. The DC-activating properties of T cells were confirmed by the analysis of in vivo responses to nonmicrobial T cell mitogens, suggesting that polyclonal activation of T cells in vivo may lead to activation of the innate immune response. Six- to 8-wk-old female BALB/c mice were purchased from Harlan Nederland (Horst, The Netherlands). Mice were maintained in pathogen-free conditions in our animal facility. Mutant mice (IL-4−/−, IL-12 p40−/−, TNF-α−/−, IFN-γ−/−, CD1d−/−, CD4−/−, CD8−/−, CD40−/−, and RAG) were either purchased from The Jackson Laboratory (Bar Harbor, ME) or bred in our own animal facility. Highly purified staphylococcal enterotoxin A, SEB, and toxic shock syndrome toxin-1 (TSST-1) were purchased from Toxin Technology (Sarasota, FL). LPS (Escherichia coli serotype 0127:B8) was from Sigma-Aldrich (St. Louis, MO). Mice were injected i.v. into the lateral tail vein with the indicated doses of LPS, SEB, TSST-1, OVA peptide, or anti-CD3ε Abs solubilized in pyrogen-free NaCl (0.9%). Control animals were injected with the same volume of diluents or with hamster control IgG. Spleens were digested with collagenase (CLSIII; Worthington Biochemical, Freehold, NJ), further dissociated in calcium-free medium and separated into low- and high-density fractions on a Nycodenz gradient (Nycomed, Oslo, Norway), as previously described (12). Cells were analyzed by flow cytometry with a FACSort cytometer (BD Biosciences, Mountain View, CA). The cells were preincubated with saturating doses of 2.4G2 (a rat anti-mouse FcR mAb; American Type Culture Collection (ATCC), Manassas, VA) for 10 min before staining to prevent Ab binding to FcR and further labeled with PE-coupled N418 (anti-CD11c) or, as indicated, biotinylated or FITC-coupled Abs including RA3-6B2 (anti-CD45R/B220), RM4-5 (anti-CD4), 53-6.7 (anti-CD8α), AF6-120.1 (anti-I-Ab), and 3.23 (anti-CD40), all from BD PharMingen (San Diego, CA). DEC-205 (anti-CD205), 14.4.4-S (anti-I-Ek,d), 16-10A1 (anti-CD80), and GL1 (anti-CD86) are available through the ATCC and were purified and labeled in our laboratory. Cells were gated according to size and scatter to eliminate dead cells and debris from analysis. Immunohistochemical techniques used in this study were described in detail by Pajak et al. (13). Spleens and lymph nodes were fixed for 3 days in Immunohistofix (Aphase, Gosselies, Belgium) followed by dehydration in a graded series of ethanol doses (30, 50, 70, 90, and 100%) for 30 min each at room temperature. Tissues were embedded in Immunohistowax (Aphase), sectioned at 3 to 6 μm, de-embedded by washing in acetone for 10 min, and transferred to PBS. The tissues sections were treated for 30 min with 1% blocking reagent (Boehringer Mannheim, Mannheim, Germany) to saturate nonspecific binding sites. The endogenous peroxidase activity was neutralized by 3% H2O2 in PBS for 60 min, and the slides were stained with the following biotinylated Abs (10 μg/ml in PBS 0.5% blocking reagent): MOMA-1 (anti-metallophilic macrophages; Serotec, Raleigh, NC), GL1 (anti-CD86; ATCC), and N418 (anti-CD11c; ATCC). Slides were then incubated as indicated with 1) avidin-biotin-peroxidase complex (Vectastain ABC kit; Vector Laboratories, Burlingame, CA) and stained with a solution of 3-amino-9-ethylcarbazole tablets (Sigma-Aldrich) or 2) avidin-biotin-alkaline phosphatase complex (Vectastain ABC kit, AK-5000; Vector Laboratories) and stained with alkaline phosphatase substrates (SK-5300, Vector Laboratories). The Vector blocking kit (Vector Laboratories) was used to block excess of biotin from the first Ab in double-stained slides. Digitized images were captured using a Ikegami CCD color camera (Ikegami Tsushinki, Tokyo, Japan) and analyzed using the CorelDraw 7 software (Corel, Ottawa, Ontario, Canada). The effect of SEB administration on DC populations from spleen and lymph nodes was visualized by immunohistochemistry. 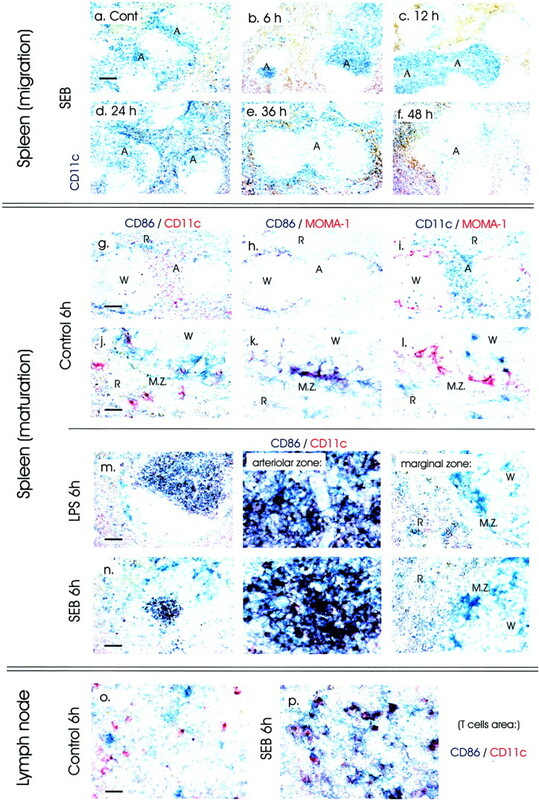 Most DC, identified as CD11c-expressing cells, were found in the splenic marginal zone and around the central arteriole of control, untreated animals (Fig. 1⇓a). Injection of SEB led to the rapid (6 h post-treatment) redistribution of most CD11c+ cells to the white pulp, in T cell-rich areas surrounding the central arteriole (Fig. 1⇓b). Most DC remained localized in the white pulp 12 h post-treatment (Fig. 1⇓c), while a gradual loss of CD11c+ cells was observed at 36 and 48 h following SEB treatment, as determined by immunohistochemistry (note the weak CD11c-specific labeling in Fig. 1⇓, e and f) and flow cytometry (Ref. 14 and data not shown). DC represent a phenotypically heterogeneous cell population, characterized by the differential expression of CD4 and CD8 markers (three subsets, CD4+CD8−, CD4−CD8+, and CD4−CD8−, have been described (15)). Using flow cytometry analysis, we have observed that both CD4+ and CD8+ DC subsets were transiently lost with similar kinetics in response to E. coli LPS or SEB, while the number of CD4−CD8−CD11c+ cells was only marginally affected. Reconstitution of splenic DC numbers was observed 2–4 days after treatment, in agreement with the rapid turnover of these cells (data not shown). SEB induce DC migration and maturation in vivo. Alkaline phosphatase (blue) and peroxidase (red) staining of embedded sections of spleens (a–n) or mesenteric lymph node (o and p) from control (PBS), SEB-injected, or LPS-injected BALB/c mice (50 μg i.v.). Sections were stained with Abs against CD11c, CD86, and MOMA-1 as indicated. A, Arteriole; R, red pulp; MZ, marginal zone; W, white pulp. Scale bars: a and g, 30 μm; j, 10 μm; m and n, 15 μm; o, 10 μm. SEB administration also induced DC maturation, as judged by the increased expression of the CD86 marker by CD11c+ cells. The expression of the CD86 marker in naive animals is restricted to cells of the marginal zone (Fig. 1⇑, g and j). Double staining experiments identified these cells as marginal zone macrophages expressing the MOMA-1 marker (Fig. 1⇑, h and k). Note that CD11c- and CD86-specific staining rarely overlap in naive animals (Fig. 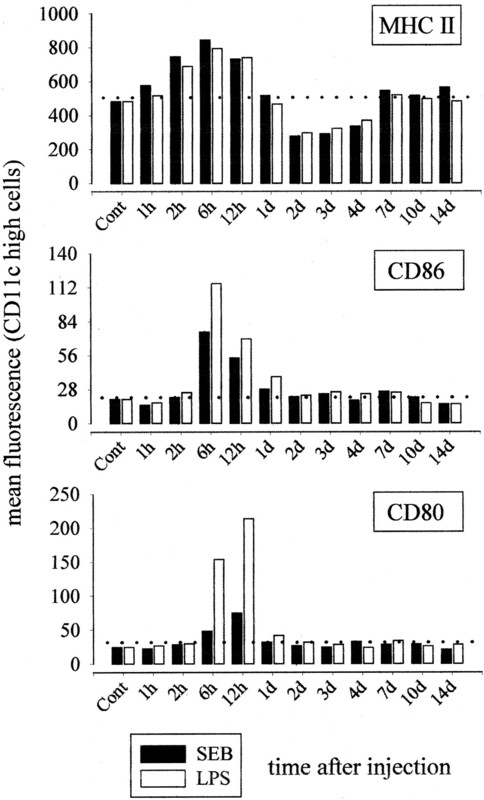 1⇑j), while most MOMA-1 expressing macrophages were also stained by the CD86-specific Ab (see Fig. 1⇑k as an example). As expected, the MOMA-1 and CD11c markers were expressed by distinct cell subpopulations (Fig. 1⇑, i and l). In marked contrast, most CD11c+ cells located in the white pulp in response to SEB or LPS (known to induce DC maturation in vivo) expressed the CD86 molecule (note the purple staining of double-labeled CD11c- and CD86-positive cells in Fig. 1⇑, m and n), suggesting that these cells had undergone maturation in vivo. The distribution of MOMA-1-positive cells was not affected by SEB or LPS administration (data not shown). Finally, while CD11c and CD86 markers were expressed by distinct cell subpopulations in lymph node sections from naive animals (Fig. 1⇑o), injection of SEB led to the maturation of DC cells of the paracortical and medullary zones of mesenteric lymph nodes, as demonstrated by the rapid (6 h post-treatment) induction of the CD86 markers on CD11c-positive cells (note the purple staining in Fig. 1⇑p). The capacity of SEB to induce DC maturation in vivo was further confirmed by flow cytometry. DC-enriched, low-density spleen cells were purified from SEB- or LPS-treated mice and analyzed at different time points for the expression of markers known to be up-regulated during DC maturation. 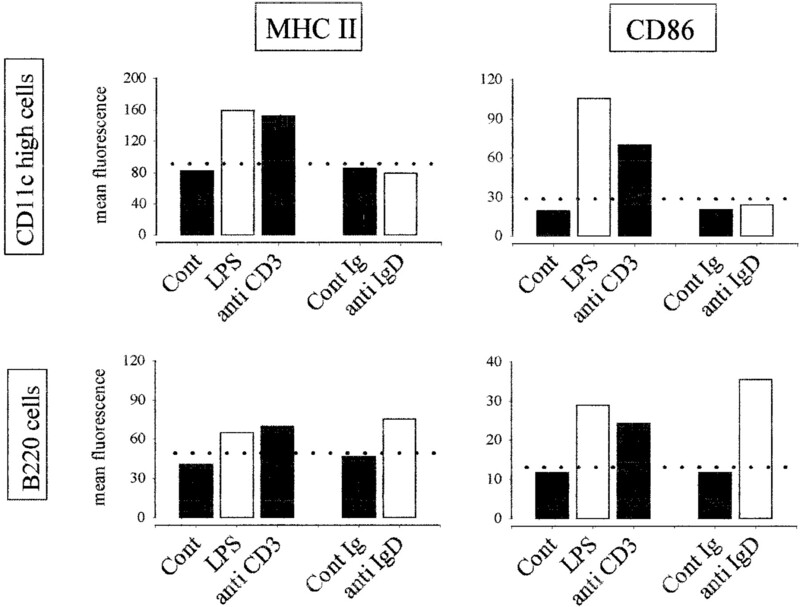 As previously demonstrated (16), LPS injection led to the increased expression of the MHC II, CD80, and CD86 markers. Similarly, SEB administration led to an increased expression of the MHC II and CD86 markers, while it only marginally affected the CD80 marker (Fig. 2⇓). Although up-regulation of MHC II determinants was detectable 2 h post-treatment, all markers were optimally expressed between 6 and 12 h after in vivo administration of both microbial products (see Fig. 2⇓). Reduced expression of MHC II markers observed 2–4 days post-treatment (see Fig. 2⇓) is probably related to reconstitution of splenic DC populations by immature DC or DC precursors (see Ref. 15) expressing lower levels of MHC II molecules. Note that all CD11c-expressing DC subsets analyzed (CD4+CD8−, CD4−CD8+, and CD4−CD8−) were found to mature in response to SEB or LPS (data not shown). Kinetic of splenic DC maturation induced by SEB or LPS. 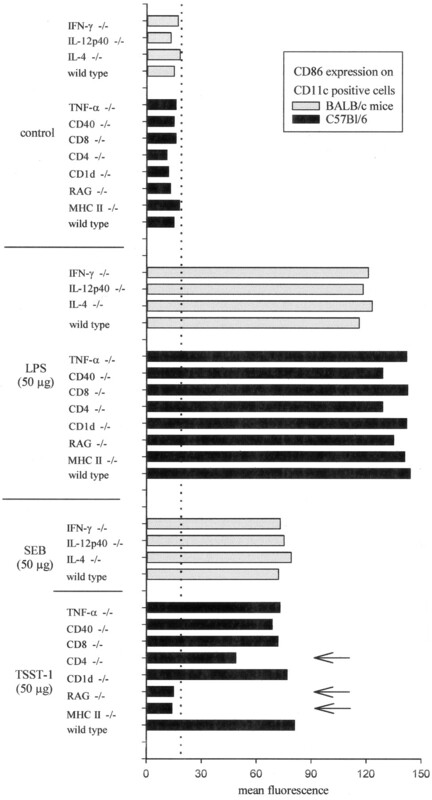 BALB/c mice were treated at various time with control (PBS), SEB, or LPS (50 μg i.v. ), as indicated. Pooled low-density spleen cells from three individuals in each group were double-stained with PE-labeled anti-CD11c and with biotinylated or FITC-labeled anti-CD80, anti-CD86, and anti-I-Ek,d, followed, when appropriate, by streptavidin-FITC. The data represent the fluorescence of cells gated for high CD11c expression. These results are representative of three independent experiments. 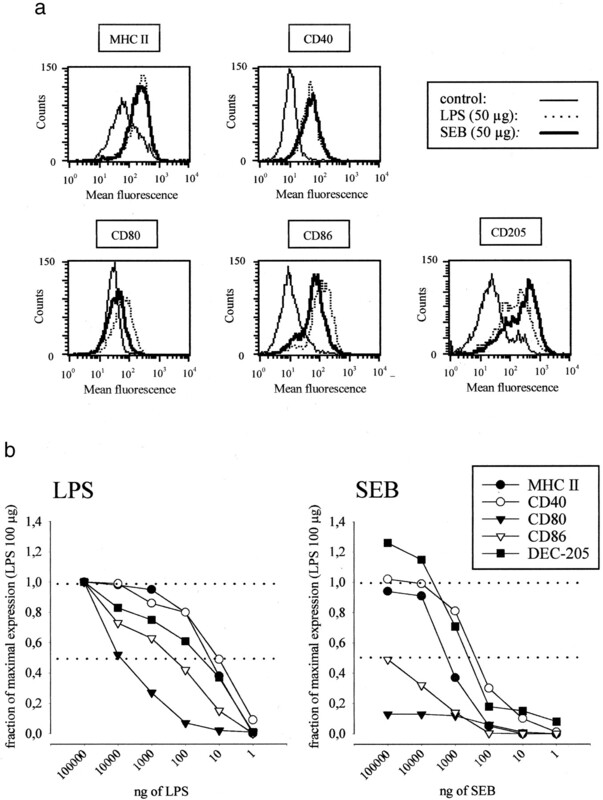 To further analyze the DC-maturing properties of bacterial superantigens, CD11c+ low-density spleen cells from LPS- and SEB-treated animals were analyzed for the expression of MHC II, CD40, CD80, CD86, and CD205 molecules by flow cytometry. As shown in Fig. 3⇓a, SEB injection led to the up-regulation of most maturation markers, albeit with distinctive efficacy when compared with LPS. Indeed, while DC that matured in response to SEB expressed optimal levels of MHC II, CD40, and CD205 molecules, they reproducibly expressed reduced and marginal levels of the CD86 and CD80 markers, respectively. This distinctive phenotype was not related to an altered kinetic of DC maturation in response to SEB (see Fig. 2⇑ and data not shown) and was preserved in response to graded doses of SEB. Fig. 3⇓b shows the results of a typical experiment in which mice were injected with graded doses of LPS or SEB and analyzed by flow cytometry as previously described. For the sake of simplicity, the results are expressed as the fraction of maximal receptor expression induced by a saturating dose of LPS (100 μg). This experiment revealed that markers often used to characterize the mature status of DC were optimally induced at different LPS doses. In particular, low doses of LPS were sufficient to induce MHC II, CD40, and CD205 up-regulation, while doses in excess of 10- to 100-fold were required to induce CD86 or CD80 expression, respectively. Injection of SEB led to an increased expression of MHC II, CD40, and CD205 molecules, and to a moderate but significant up-regulation of the CD86 marker. Note that doses of SEB (10–100 μg) known to induce an inflammatory response in vivo mimicking the naturally occurring response to toxin-producing strains of S. aureus in humans (6) were found effective in inducing DC maturation. 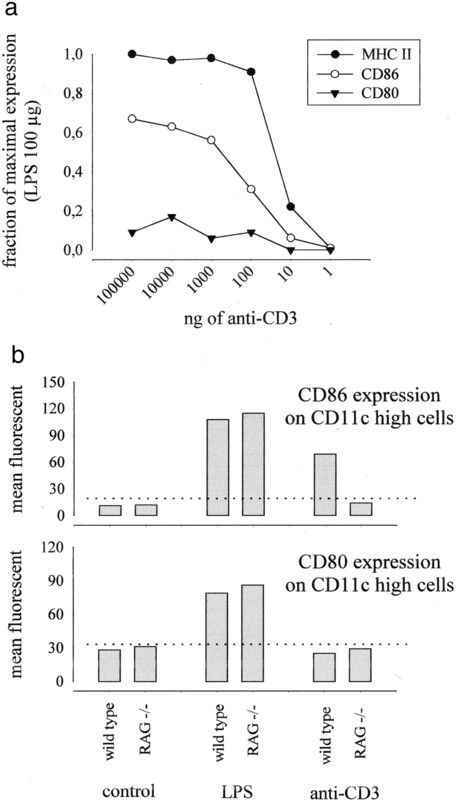 This experiment confirmed that DC isolated from SEB-injected mice display a distinctive phenotype, characterized by increased expression of CD40, CD205, and MHC II molecules but only a moderate up-regulation of the costimulatory markers CD80 and CD86, known to interact with the CD28/CTLA4 counterreceptors. It is noteworthy that the relative expression of the CD205 and CD80 markers differed markedly between DC that matured in response to LPS or SEB, suggesting that DC may respond differently to these microbial products. Similar results were obtained using both staphylococcal enterotoxin A and TSST-1 staphylococcal superantigen (data not shown). DC that matured in response to SEB express a distinctive phenotype. a, BALB/c mice were treated with control (PBS), SEB, or LPS (50 μg i.v.). Pooled low-density spleen cells from three individuals in each group were purified 9 h after injection and double-stained with PE-labeled anti-CD11c and with biotinylated or FITC-labeled anti-CD40, anti-CD80, anti-CD86, anti-CD205, and anti-I-Ek,d, followed, when appropriate, by streptavidin-FITC. The data represent the fluorescence of cells gated for high CD11c expression. These results are representative of six independent experiments. b, BALB/c mice were treated with various dose of SEB or LPS (1–105 ng, as indicated), and the low-density spleen cells were purified 9 h after injection. Pooled low-density spleen cells from three individuals in each group were double-stained with FITC-labeled anti-CD11c and with biotinylated anti-CD40, anti-CD80, anti-CD86, anti-CD205, and anti-I-Ek,d Abs followed by streptavidin-PE, as indicated. The data represent the fluorescence of cells gated on the base of high CD11c expression. Mean fluorescence detected for each marker is expressed as a fraction of the maximal expression observed in response to 100 μg of LPS. These results are representative of three independent experiments. The role of MHC II and T cell subsets in mediating the DC-maturing properties of bacterial superantigens was studied using a panel of genetically manipulated mice. Mutant mice were treated with the indicated superantigen (mice in the C57BL/6 background were injected with TSST-1, a staphylococcal superantigen known to optimally stimulate I-Ab-expressing mouse strains, while BALB/c mice expressing the I-Ed molecule were injected with SEB) and LPS and analyzed as previously described for the expression of several DC-specific maturation markers. For the sake of simplicity, only expression of CD86 is reported in Fig. 4⇓ (similar results were obtained for CD40, CD80, and MHC II expression; data not shown). LPS induced DC maturation in all mouse strains studied (Fig. 4⇓). In marked contrast, in vivo activation of DC by TSST-1 required both T cells and the expression of MHC II molecules. In particular, MHC II+/+RAG−/− (which lack both T and B cells) mice failed to up-regulate CD86 in response to TSST-1, suggesting that binding of bacterial exotoxins to MHC II is not sufficient to induce DC maturation. MHC II-deficient mice also lack CD4+ cells and were unresponsive to TSST-1-induced DC maturation. TSST-1 was able to induce partial DC maturation in both CD4−/− and CD8−/− mice, indicating that both CD4- and CD8-expressing T cell subsets were able to mediate DC maturation. Note, however, that CD4+ T cells appeared to be more efficient than CD8+ T cells in mediating TSST-1-induced DC maturation, as shown by the enhanced CD86 expression of DC from CD8−/− mice in response to bacterial superantigen injection. NKT cells represent a subset of lymphocytes that express a CD1d-restricted TCR repertoire, with the great majority expressing an invariant TCRα (Vα14-Jα281) paired with Vβ8, -7, or -2. Numerous observations suggest that these cells rapidly respond in vivo to mitogenic or specific stimulation by producing high levels of cytokines, including IL-4 and IFN-γ; therefore, these cells have been implicated as potential effector cells in innate-like immune responses to virus or tumors (17). These data prompted us to test the potential role of NKT cells in inducing DC maturation in response to SEB. As shown in Fig. 4⇓, injection of SEB in CD1d−/− mice led to DC maturation, suggesting that NKT cells do not play a critical role in DC activation by bacterial superantigens. CD40 ligation by Abs or CD40 ligand-transfected cells is sufficient to induce DC maturation in vitro (18). However, the CD40 molecule was found dispensable for DC maturation in vivo in response to TSST-1 (Fig. 4⇓). Finally, absence of IL-4, IFN-γ, TNF-α, or IL-12 p40 did not affect the ability of superantigens to induce DC maturation (Fig. 4⇓). Collectively, these data indicate that DC maturation in response to bacterial superantigen is a consequence of in vivo T cell stimulation induced by the simultaneous binding of the exotoxin to selected Vβ regions of the clonally distributed TCR and to a conserved domain of the class II molecules. DC maturation induced by superantigen requires T cells and expression of MHC II molecules. Wild-type and mutant mice (as indicated) were treated with SEB, TSST-1, or LPS (50 μg i.v. ), and the low-density spleen cells were purified 9 h after injection. Pooled low-density spleen cells from three individuals in each group were double-stained with FITC-labeled anti-CD11c and biotinylated anti-CD86 Abs followed by streptavidin-PE. The data represent the fluorescence of cells gated on the base of high CD11c expression. These results are representative of three independent experiments. The previous experiments strongly suggested that polyclonal activation of naive T cells in vivo may lead to DC maturation. To formally demonstrate that T cell responses can induce DC maturation in the absence of microbial products, naive mice were injected with mitogenic anti-CD3ε Abs. In keeping with our previous observations, activation of naive T cells in vivo led to DC maturation, characterized by DC migration (Ref. 19 and data not shown) and up-regulation of MHC II and CD86 molecules (Fig. 5⇓a). It is noteworthy that a selective deficiency in CD80 up-regulation in response to a wide range of Ab doses was observed. Use of RAG-deficient mice confirmed the role of T cells in mediating DC maturation in response to anti-CD3ε mAbs (Fig. 5⇓b). These observations were extended to two additional experimental models in which a sufficient number of T cells were stimulated in vivo by an adequate Ag/MHC combination. Control mice and mice transgenic for an OVA-specific TCR (BALB/C DO.11.10 strain) were injected i.v. with the nominal antigenic peptide from OVA. Transgenic, but not control, mice responded to peptide injection by increased expression of MHC II and CD86 on CD11c-expressing cells (Fig. 6⇓a). Similar observations were performed in the C57BL/6 OTII OVA-specific TCR-transgenic mouse strain (data not shown). DC maturation in response to mitogenic anti-CD3 mAbs. Wild-type BALB/c and RAG BALB/c mice were treated with graded doses of control (hamster Ig), anti-CD3ε Abs (145–2C11), or LPS, and the low-density spleen cells were purified 9 h after injection. Pooled low-density spleen cells from three individuals in each group were double-stained with FITC-labeled anti-CD11c and biotinylated anti-CD80, anti-CD86, and anti-I-Ek,d Abs followed by streptavidin-PE, as indicated. The data represent the fluorescence of cells gated on the base of high CD11c expression. a, Mean fluorescence detected for each marker is expressed as a fraction of the maximal expression observed in response to 100 μg of LPS. These results are representative of three independent experiments. Administration of allogeneic cells and nominal Ag in TCR-transgenic mice induces splenic DC maturation. a, Wild-type BALB/c and DO11.10 TCR-transgenic mice were treated with OVA peptide or LPS (50 μg), and the low-density spleen cells were purified 9 h after injection. Pooled low-density spleen cells from three individuals in each group were double-stained with PE-labeled anti-CD11c and biotinylated anti-CD80, anti-CD86, and anti-I-Ek,d Abs followed by streptavidin-FITC, as indicated. The data represent the fluorescence of cells gated on the base of high CD11c expression. These results are representative of two independent experiments. b, F1 C57BL/6 × DBA/2 mice were injected with syngeneic or allogeneic (C57BL/6) splenic cells (108 cells) or LPS (50 μg), and the low-density spleen cells were purified 9 h after injection. Pooled low-density spleen cells from three individuals in each group were analyzed as described in a. These results are representative of two independent experiments. Similarly, C57BL/6 spleen cells were injected into semiallogeneic recipients (C57BL/6 × DBA/2), and expression of DC markers was analyzed as previously described. Injection of cells known to react with donor MHC molecules expressed by the DBA/2 parent led to the maturation of host-derived DC in vivo, as judged by increased expression of the I-Ed MHC II molecules (of DBA/2 origin) and moderate but significant up-regulation of the CD86 marker (Fig. 6⇑b). In agreement with the previous observations, T cell-induced DC maturation in vivo led to a distinctive DC phenotype, characterized by a weak up-regulation of the CD80 marker (Fig. 6⇑). Lack of DC maturation following an in vivo polyclonal B cell response. BALB/c mice were treated with control Abs, anti-IgD Abs (300 μg), anti-CD3ε Abs (50 μg), or LPS (50 μg), and the low-density spleen cells were purified 9 h after injection. Pooled low-density spleen cells from three individuals in each group were double-stained with PE-labeled anti-CD11c and with biotinylated anti-CD86 and anti-I-Ek,d Abs followed by streptavidin-FITC, as indicated. The data represent the fluorescence of cells gated on the base of B220 or CD11c expression, as indicated. These results are representative of three independent experiments. The major role of the immune system is to identify and eliminate pathogens. Cells of the innate immune system appear well equipped for sensing pathogens or danger signals delivered by infected cells, as they express a series of receptors able to selectively interact with conserved microbial products or with soluble mediators released and/or produced by infected cells (e.g., heat shock proteins and IFNs). DC have been recognized as an important cell population able to link pathogen detection with regulation of the adaptive immune response. Indeed, recognition of PAMPs by DC-expressed TLRs induces DC maturation, thus causing migration of these cells into T cell-enriched areas of lymphoid tissues and up-regulation of molecules (membrane bound or secreted) known to costimulate T lymphocytes in the presence of Ag (reviewed in Refs. 3 and 4). Therefore, it is assumed that recognition of pathogens by the innate immune system is a prerequisite for the induction of an adaptive immune response. The major conclusion from the present study is that polyclonal T cell responses in vivo, such as those induced by staphylococcal superantigens, induce DC maturation in vivo, characterized by a distinct phenotypic profile. Injection of staphylococcal superantigens induced the rapid migration of splenic DC to the white pulp and the up-regulation of MHC II, CD40, CD80, CD86, and CD205 on all DC subpopulations tested. Despite wide variation in their protein structure, staphylococcal superantigens share the ability to simultaneously interact with MHC II molecules and the variable region of the TCR Vβ chain. Although additional receptors for these bacterial toxins have been reported (9, 10, 11), it is clear from this study that interaction of staphylococcal superantigens with both MHC II and TCR Vβ molecules is required for optimal DC maturation in vivo (Fig. 4⇑). Therefore, it is tempting to speculate that polymorphic receptors (MHC II and TCR Vβ molecules) primarily dedicated to the recognition of Ags in the context of the adaptive immune response act as pattern recognition receptors when confronted with bacterial superantigens. The mechanism by which superantigens cause DC maturation is presently unclear. Experiments in which T cells were activated in vivo by ligands of nonmicrobial origin support the notion that DC mature as a consequence of an excessive in vivo T cell response. Indeed, stimulation of a sufficient number of T but not B lymphocytes in vivo by nominal Ag/MHC complexes (OVA peptide or allo-MHC) or anti-CD3ε mAbs led to DC maturation. Of note, injection of bacterial superantigens (23), anti-CD3ε mAbs (24), or nominal Ag in a TCR-transgenic model (25) cause the rapid (1–3 h post treatment, depending on the experimental settings) activation of T cells to cytokine secretion. In keeping with these observations, in vivo signaling studies performed in an OVA-transgenic model recently demonstrated that most Ag-specific T cells were activated in vivo a few minutes after Ag administration (26). Thus, in contrast to predictions mostly based on in vitro studies, activation of T cells in these experimental models precedes DC maturation, and in particular up-regulation of costimulatory molecules. This conclusion is strengthened by the aforementioned study (26), in which activation of naive, TCR-transgenic T cells in vivo by Ag was found to be largely CD28 independent. Collectively these observations support the notion that naive T cells can be rapidly stimulated in vivo in the absence of pathogen-derived danger signals and eventually initiate a series of events leading to DC maturation. This conclusion is also supported by a study performed with human cells which demonstrated that Ag-stimulated T cells can positively regulate the expression of costimulatory molecules on DC (27). Soluble signals (inflammatory cytokines) and cell-cell interactions (such as CD40/CD40 ligand signaling) are known to initiate DC maturation in vitro. However, despite numerous experiments using genetically manipulated mice, we could not single out a soluble mediator responsible for T cell-dependent DC maturation. Indeed, SEB induced an optimal DC maturation in mice defective for TNF-α, IL-4, IL-12 p40, and IFN-γ. Similarly, TSST-1 induced DC maturation in CD40-deficient mice (Fig. 4⇑). Therefore, it is not clear whether bacterial superantigen-induced maturation requires DC/T cell contacts or whether it is mediated by a functionally redundant set of soluble mediators. In any event, the available evidence indicates that activation of a sufficient number of naive T cells in vivo represents a novel danger signal, functionally linked to DC maturation. In keeping with this conclusion, it has been recently demonstrated that adaptive stimuli (such as provided by a high frequency of Ag-reactive T cells) can increase the number of Ag/MHC complexes displayed by DC in vivo (28). Although both innate and T cell-mediated danger responses activate DC, maturation of this cell population does not represent a homogeneous stereotyped biological response, as is often inferred from in vitro studies. Indeed, the phenotype of DC varied according to the origin and dose of microbial products. In particular, low doses of LPS (in the 10-ng range) and SEB (in the 1-μg range) were sufficient to elicit up-regulation of CD40, CD205, and MHC II molecules, while near-lethal doses of SEB (100 μg) were unable to effectively induce CD80 up-regulation, suggesting that expression of the CD80 costimulatory molecules may be under the strict control of the innate immune response. These observations provide evidence for a graded response of DC to maturation stimuli, suggesting that DC may display distinct phenotypes reflecting both the origin and the intensity of a danger signal (see Ref. 29). The functional consequence of these distinct DC phenotypic profiles on the in vivo adaptive immune response is difficult to establish. One of the best-characterized consequences of bacterial superantigen administration is the induction of anergy and/or apoptosis in a fraction of responding T cells (6, 7, 8); therefore, it is tempting to correlate this inadequate T cell response with the unusual phenotype of SEB-activated DC. Interaction of T cells with DC able to simultaneously provide a strong signal 1 (due to the high expression of MHC II molecules) and a low signal 2 (due to reduced expression of CD28 ligands, known to promote T cell survival (30)) may explain the altered response of these cells and their propensity to die by apoptosis. Accordingly, it has been shown that Ag presentation to T cells in vivo by immature DC induced incomplete and nonsustained T cell activation (31). The observations reported in this study do not contradict the well-accepted notion that responses to Ags for which a low frequency of responding cells is available in the periphery is strictly dependent on costimulation delivered by DC that have matured under the influence of innate immunity-derived signals. In particular, autoreactive T cells that escaped negative selection in the thymus are present at low frequencies in the periphery, and their activation probably requires adequate costimulation only provided by mature DC. As previously discussed, the response to bacterial superantigens represents a clear exception to this rule. A second exception that bears significant clinical relevance is the response to allo-MHC determinants. The induction of a vigorous allograft rejection in the absence of inflammation has recently been reported (32). These authors elegantly demonstrated that well-healed skin and vascularized cardiac allografts were efficiently rejected by T cells developing from a transplanted marrow graft. These studies are in agreement with the observations reported herein, which suggest that a high frequency of responding T cells is sufficient to initiate a series of events (including DC migration and maturation), culminating in the induction of an adequate adaptive immune response. The observations reported herein provide a sound basis for understanding why alloreactive T cells that are continuously produced in the bone marrow of transplanted patients represent a continuous threat for a well-functioning allografts, even in the absence of additional danger signals. In conclusion, these studies are in line with the concept that DC represent an important biological integrator of danger signals. The stimuli that activate DC maturation and thereby initiate adaptive immune responses are 1) exogenous microbial products interacting with cells of the innate immune system; 2) endogenous signals released by cells under stress, damage, or necrotic death; and, finally, 3) usual stimulation of a large fraction of naive T cells, which can only occur in response to exogenous signals such as superantigens or allo-MHC determinants. A better understanding of the signals involved in DC maturation induced by polyclonally activated T cells in vivo may ultimately lead to improved treatments for septic shock caused by bacterial superantigens and for inducing and maintaining peripheral tolerance to allografts. We thank Dr. Georges Leclercq (Rijksuniversiteit Gent, Gent, Belgium), Dr. Kris Huygen (Pasteur Institute, Brussels, Belgium), Dr. Luc Van Kaer (Howard Hughes Medical Institute, Nashville, TN), and Dr. Michel Braun (Université Libre de Bruxelles, Brussels, Belgium) for providing mutant mice, Annette Van Acker for assistance in animal treatments, Philippe Veirman for technical assistance, and Muriel Moser for criticism of the manuscript. ↵1 This work was funded by the Belgian Program in Interuniversity Poles of Attraction initiated by the Belgian State (Prime Minister’s Office, Science Policy Programming), and by a Research Concerted Action of the Communauté Française de Belgique. The scientific responsibility is assumed by its authors. E.M. is supported by the Fonds National de la Recherche Scientifique. ↵2 E.M. and C.D.T. should be considered equally as first authors. ↵4 Abbreviations used in this paper: DC, dendritic cell; MHC II, MHC class II; TSST-1, toxic shock syndrome toxin-1; SEB, staphylococcal enterotoxin B; TLR, Toll-like receptor; PAMP, pathogen-associated molecular pattern.